HZQ series launching gantry integrating carrying and installing girders combines two functions: it can lift and install precast girders to proper position as a launching gantry; as the rear part is divided with launching gantry, it is used as a gantry crane to carry girders in the precast yard to the rear part of launching gantry for girder feeding, which saves construction cost for customers, quite convenient. 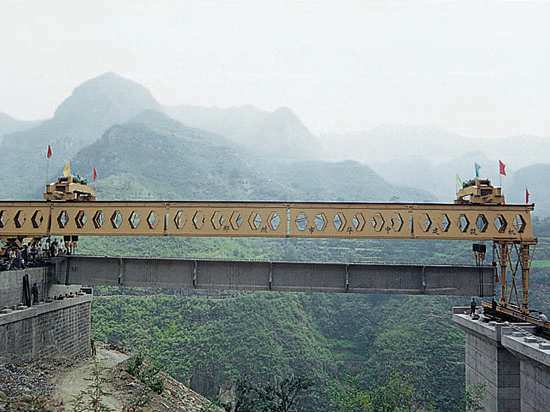 While it is suitable for bridge construction with less girders and short distance. ◆ The machine can accomplish the girder’s carrying with erecting at the same time. ◆ The machine can erect 4 pieces of girders with another two cranes one day, saving construction cycle. 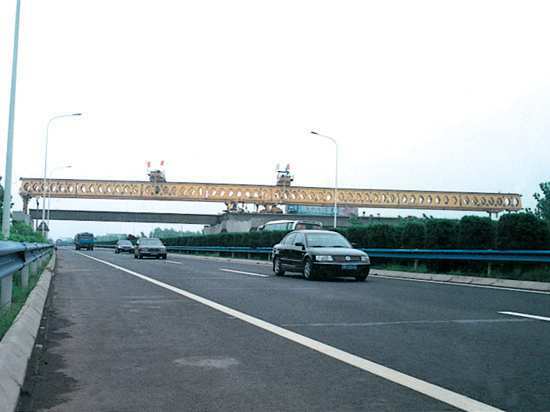 ◆ Another advantage: if the concrete girder is between the two piers, just exchange the front and rear legs, it can continue to work, no extra assembly, shortening construction period. Working condition and requirements of design etc. ◆ Calculation analysis and check-calculation of the whole structure According to technology condition of design of crane, we confirm the construction condition, and then calculate and analyze the strength, stiffness and stability. After the classical calculation, we start the calculating work of design of steel structure, and adopt the finite element analysis, the load applied to models respectively, and then calculating and analyzing beam element and plate element. Finally, the authoritative department will check and calculate again. ◆ Firstly, the technology department reviews the drawing from manufacturability. ◆ Drawing up the technology guide book and making procedure qualification. 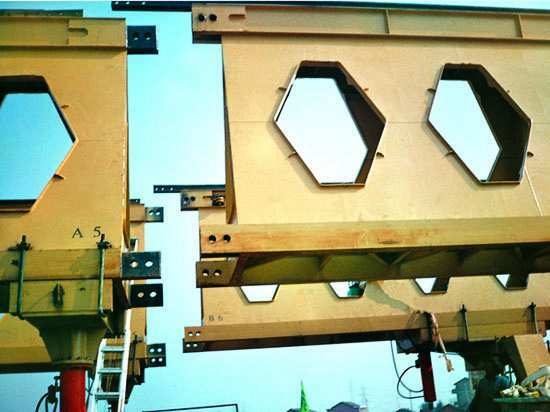 ◆ Making welding procedure card, mechanical manufacturing card, assembly process, camber drawing of box girder according to drawing , rules and criterion ; emphasizing the size of welding angle, geometry size and requirements of assembly etc. ◆ Designing the assembly technology clamp according to the requirements of drawing. ◆ Making the finishing time of manufacture and patrolling card according to the requirements of drawing; controlling the quality of manufacture strictly. ◆ checking descriptive chart（controlling the geometry size and key part）. ◆ The tracing data of product is made up of contract, review file, drawing , calculation book of design, specification, installation project, raw material quality certificate, product quality inspection record, welding inspection report and purchased certificate. ◆ leaving factory data is made up specification, installation project, certificate and receiving report etc. 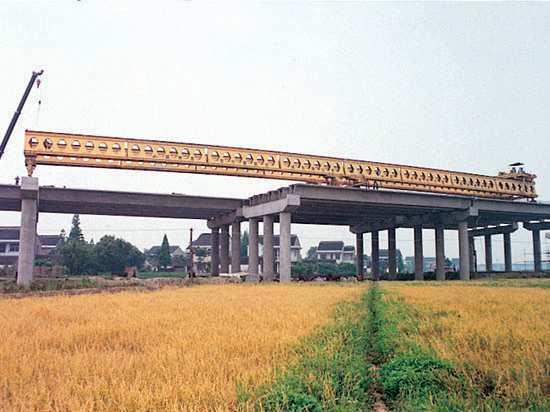 ◆ assemble two sides main girder symmetrically. ◆ test run and commissioning. ● Checking connecting parts connect firmly or not. ● Checking the electric connection is correct and limit switch is reliable or not. ● Checking parts of hydraulic system leak oil or not and the lifting is good or not. ● Checking mechanism and structure parts run successfully or not. 9.5、checking lubricating condition of rotating parts. ● Checking the oil level meet the requirements or not ,and then making a trial run . ● After all of above checking and adjustments are finished, and making sure every part goes well, and then doing the trial run. 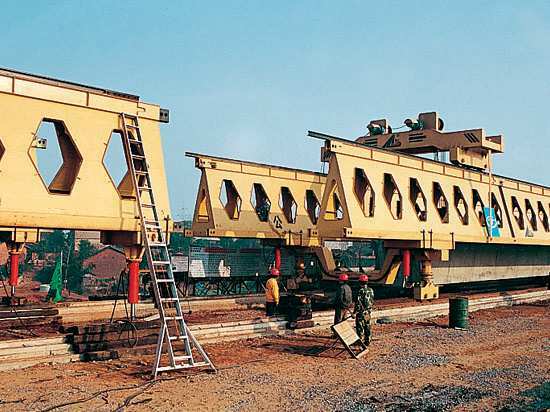 ● Adjusting the height of transverse rails of front legs and middle legs when erecting girder or moving from one pier to keep main girder’s longitudinal slope≤0.5%，transverse slope≤0.5%. 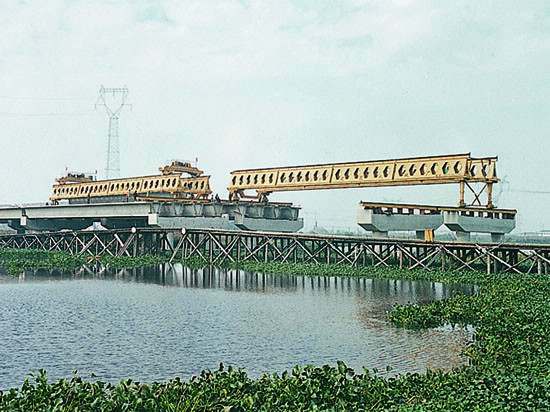 ● The normal working wind speed should less than 6 grade when launching gantry works in the open air ; when the wind exceed 6 grade, the launching gantry shouldn’t moving from one pier to next pier, and components should be locked; the machine can’t work in thunderstorm day and must cut off power. ● When the tubes of components are fault, the operator should cut off power immediately, and it is checked and repaired by the professional technician; the operator shouldn’t disassemble privately; when checking and repairing the machine , the technician must cut off the power. After construction are finished everyday, the workers must check the following content: if the level of main longitudinal girder meets the requirements or not; the connection of bolts and pins are firm or not; the electrical wires are broken and extruded; hydraulic system is regular or not; the track joints are plain and smooth or not; the connection of position limiter of crane and trolley are firm or not; the rail clamping device is in the working position or not; bed timber is plain and stable and the size of gauge is right or not etc. The welding lines are checked every month :：upper and down chords of main girder , web plate, vertical welding lines of legs and the welding lines of connecting frame etc. The operators should stop working when the welding lines are broken or fatigue crack. When the users find the crack by eyes, but they can’t make sure the dangerous degree, so they should use the welding inspection instrument to test and then adopt reasonable steps to deal with. About the painting of structure which should be painted again every two years. The users should clean the primary surface by steel brush and pay attention to the welding lines before the structure are painted. The lifting mechanism, traveling mechanism of crane and trolley, reducer of motor and steel rope of winch are lubricated and maintained according the rules of specification. The machine is disassembled according to the following steps after the erection construction is finished. ● 2.0m sleepers are paved to nearby middle and rear legs respectively. ● take back the cylinder of legs and the put on the transporter. ● two lifting trolley are lifted and then put on the transporter by the special gantry. ● disassembling front, middle and rear legs and front and rear connecting frame. ● disassembling the coupling pin from back to front , each beam is carried in order and then the disassembly is finished. ● when disassembling and carrying the parts, brutal work and violent collision are prohibited, special hook and lifting tools are used for lifting. Connecting bolts and pins are put in order after they disassembled to avoid disordering and losting; the disassembly and assembly of connecting plates must be in order, and they must be marked clearly before they disassembled and assembled.